Few months back Facebook unveiled one of the biggest feature for it users Timeline. Which allows you to give a new look to your Facebook Profile and also adds a little extra eye-candy to the social network. Now you can also enjoy this new feature on your iPad with Timelines for Facebook free app. Just install the app in your iPad and you can see your and your friends’ timelines. It includes swipe-based navigation, profile and timeline customizations, quick links and support for multiple accounts. It also provides you with a whole new experience of using Facebook. 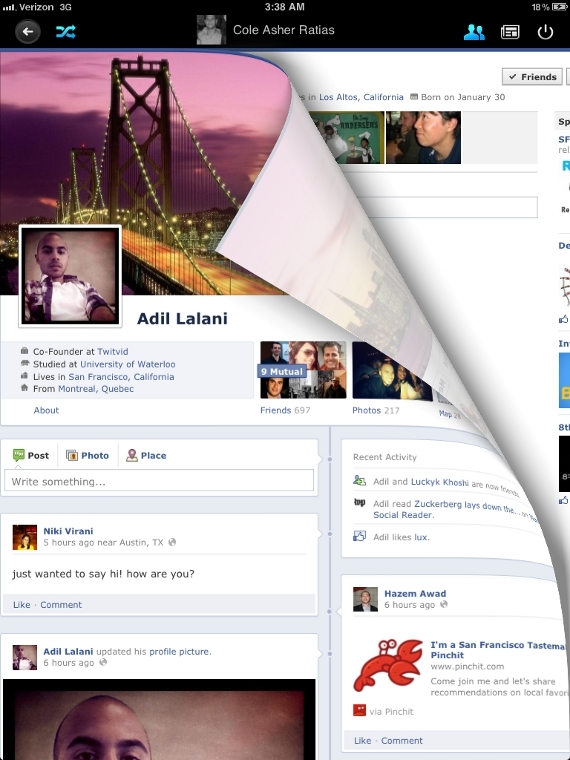 Timelines for Facebook app also adds cool looking page transitions between profiles that emulates the turning of a page in book. With the help of Timelines for Facebook app you can flip through Profiles & Timelines in alphabetical OR random order, it has swipe-based navigation, feel like you are reading a book and support for multiple accounts.